(Natural News) According to a study spearheaded by a group of Swedish researchers, acupuncture can offer relief to babies with colic, especially if conventional methods have proven ineffective. Colic is a condition that causes bouts of continuous crying among babies, often without a clearly discernible reason. The researchers recruited healthy infants that were at least two to eight weeks old. The infants have been crying for over three hours a day, at least three days a week. Cow’s milk protein was also excluded from the babies’ and their mothers’ diet. For the randomized trial, 98 babies were given four sessions of acupuncture over two weeks while 49 babies weren’t given any treatments. The 98 infants received quality conventional treatment at specialist child health centers. The acupuncture was minimal and it involved “very few needles, very shallow insertion, retained for a very short time period,” per the usual practice among acupuncturists that specialize in treating infants. The effectiveness of the treatment was measured in crying time, which the parents recorded in diaries. Both the parents and nurses were blinded to avoid biased results. This meant that they didn’t know if their baby underwent acupuncture sessions. The study recorded three different kinds of crying. Once the trial had concluded, the babies who had acupuncture sessions had a 41 percent reduction in crying time compared to 33 percent in the babies without acupuncture. While these figures are not statistically significant, it’s possible that when combined with data from three other separate trials the larger total numbers would indicate more positive results. Parents worried about their babies with colic might be wondering if this difference in the results is worth signing up their babies for acupuncture sessions. It’s worth keeping in mind that the success of the treatment might vary depending on how the baby responds to the treatment. To help you decide, consider the response rates in the trial. The percentage of no-acupuncture babies still defined as colicky at the end was a whopping 65 percent. Not all fussy babies suffer from colic. While other infants normally cry for about two to three hours every day, the crying of colicky babies is usually spread out during the whole day. Colicky babies will begin crying or fussing suddenly, usually after a feeding. Their crying is loud and continuous and can last from one hour to at least four hours. Symptoms include a flushed or red face, and their stomachs can sometimes be distended or prominent. Their legs will also alternate between flexed and extended straight out while their feet can be cold. 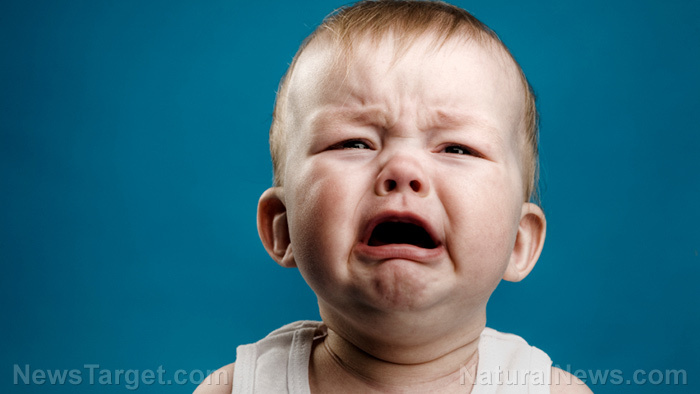 Crying colicky babies may also clench their hands. The crying episodes can occur at any time of the day or night, but it will often start late in afternoon or early in the evening, which is usually when parents or caregivers are very tired. Visit Healing.news to learn more about how acupuncture can help babies with colic.